Patients may one day see a benefit that can be tied back to rotenone research. There’s an ancient saying: “We’re standing on the shoulders of giants.” It means that each discovery or truth builds on previous discoveries. 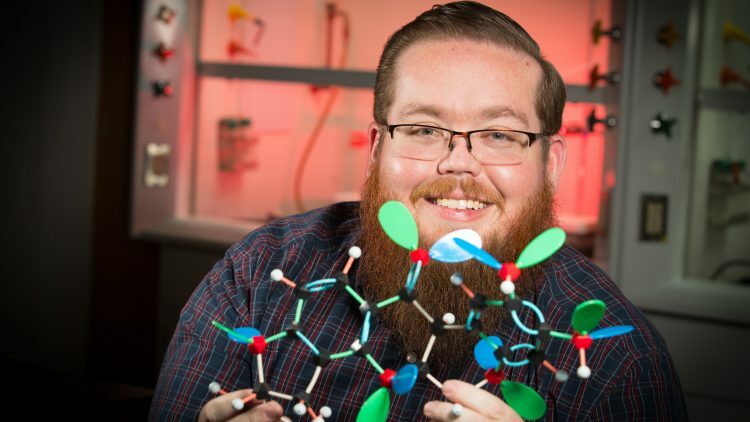 Dr. Matt Siebert, associate professor of chemistry at Missouri State University, talks about how his foundational research works toward the goal of ending disease. The chemical compound that drew Siebert’s interest will be unfamiliar to many: rotenone. It’s commonly found with the South American barbasco root. It can also be found in other plants in North and South America, southeast Asia, the southwest Pacific Islands and even southern Africa. Siebert and a graduate student conducted a series of experiments to identify the final few steps in the development of rotenone. He likens it to a puzzle. Once you know how the pieces fit together, it is easier to solve. When scientists make a discovery about chemical composition, creation or interaction, they are able to use that knowledge to develop antidotes for combatting harmful chemicals. His studies, he noted, have the potential to assist in the development of new pharmaceuticals to fight Parkinson’s and other disorders.